Magnuson Hotels, the world’s largest independent hotel group, announced today the complete rebranding of the Magnuson Hotel Lansing. Formerly a Days Inn Lansing, this 167-room hotel seeks to upgrade its local, regional and national market position through its affiliation with the Magnuson Hotels brand designation. Corporate, educational, government and leisure travelers will appreciate the 100% non-smoking Magnuson Hotel Lansing is located near Michigan State University, Michigan State Capitol, GM Grand River Assembly Plant, Lansing Center, Woldumar Nature Center, Lake Lansing, Funtyme Adventure Parks and Ingham County Fairgrounds. The Magnuson Hotel Lansing offers guests a free Continental breakfast served from 6:30 am to 10:30 am, fitness room, free high-speed wireless Internet access, guest laundry, business center, meeting facilities, free parking with room for large vehicles and a wakeup service. Small pets are accepted with additional charges. Guest rooms offer cable TV with extra stations, free high speed wireless internet access, hair dryer, free local calls, air conditioning, alarm clock/radio, iron/board and electronic door locks. 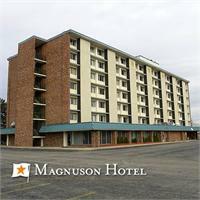 “Guests will enjoy the variety of activities near the Magnuson Hotel Lansing. We are proud to welcome owner Ray Dias and his staff, and are committed to increasing their property visibility and reservations,” stated Thomas Magnuson, CEO. As a Magnuson Hotels affiliate, the Magnuson Hotel Lansing will receive complete brand representation across North America and the UK, without the costs and requirements of franchise brand affiliation.